Copyright resides with the original photographer, no reproduction without permission. The photo is of a production meeting for Pebble Mill at One, circa 1982ish. 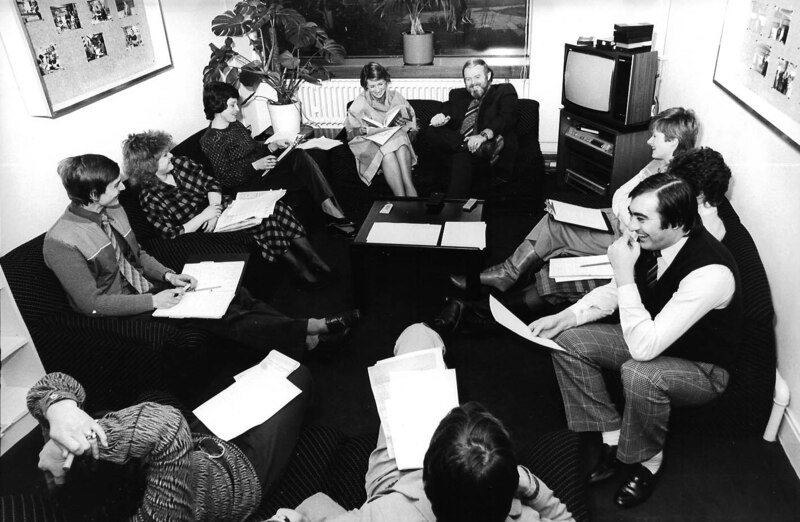 Left to right the photo shows me (Mark Kershaw), researcher Jane Marriott (now Jane Clement), producer Stephanie Silk, presenters Marian Foster and Donny Macleod, Nicky Barfoot, probably Peta Newbold, and Peter Hercombe perched on the edge, then probably David Weir and Sue Ashcroft. Yes, that is definitely Sue Ashcroft in the bottom left. I recognise her by her hands and rings, because that’s my Mum!